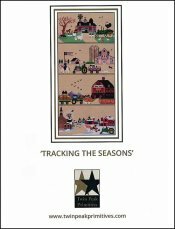 Tracking The Seasons [G1892] - $23.00 : Yarn Tree, Your wholesale source for cross stitch supplies. Cross stitch pattern by Twin Peak Primitives. The John Deere tractor is fired up & ready to take us through the seasons. The first season we are going to visit is spring. Goats, sheep, chickens & horses welcome you into Spring. The doors on the big red barn have been swung open, letting all the fresh air in. Flowers are beginning to bloom & Mr. Chicken has decided the tractor is his to ride. Don't forget the sunscreen, summer has arrived! A Fourth of July parade is coming through town. A gentleman wearing a red, white & blue top hat drives the tractor with a sheep standing in the wagon. The puppy dogs run fast behind him, trying to catch up! The third season we get to visit is fall! A variety of pumpkins line the drive going into the barn & leaves on the trees begin to change colors. Listen carefully, a barn dance is going on. Bundle up, winter has arrived. Snow blankets the ground of the farmstead where sheep are walking & pigs are eating. Spring, summer, winter, fall...which season is your favorite of them all? Stitch count is 199W x 430H. Stitched on #5357 Zweigart Aida 14ct. Oatmeal Rustico.